Luke Lulu Products are all handmade with care in our South Florida studio. We use Carters bodysuits - the gold standard for sizing and fit. These outfits are incredibly durable and go through multiple washes while maintaining its fit and color. Wash with like colors on delicate inside out and line dry. Iron on high heat. We use designer fabrics for all our outfits, which is why our outfits look so amazing in photo shoots and birthday parties. We guarantee your complete satisfaction or your money back! Set includes dress, tie, and headband for $54. Outfits are either offered in short sleeve or long sleeve. 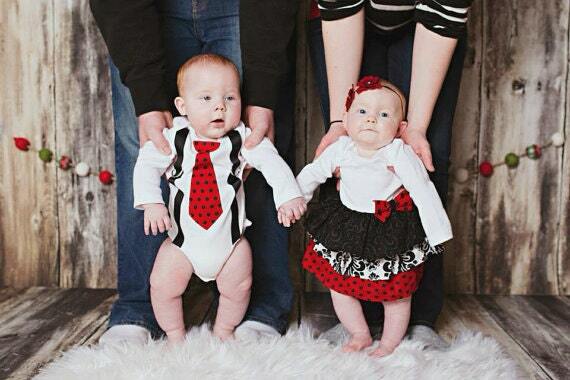 Adorable handmade twin theme boutique style outfits designed by twin mom for photos, birthdays, and special events. Made from Carters 100% cotton bodysuits; Riley Blake designer cotton fabric.